Fence mesh creates a barrier by forming consistent patterns with wire. In the case of Red Brand fences, mesh is made using different gauges of wire for very different applications. 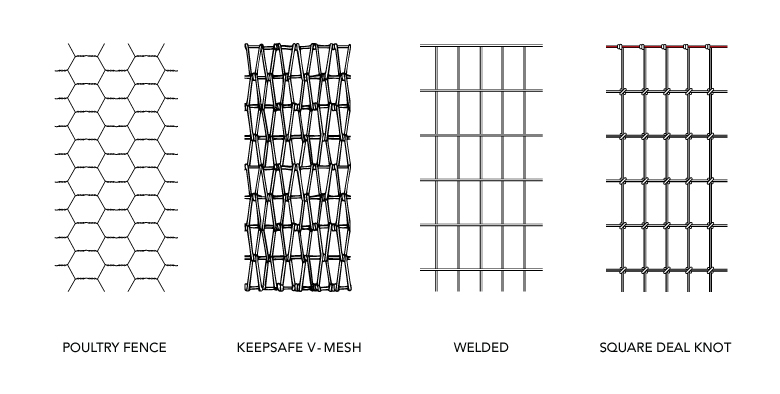 Our mesh designs can have spacing as small as 1″ or as large as 16″ between horizontal and vertical intersections. Mesh can be constructed by either weaving a continuous wire into a pattern, or by welding or knotting individual cross wires together. The different patterns in which these wires are woven determine the type of mesh. Red Brand fence is available in three different forms: netting, squared, or v-mesh. Most of our catalog of fence is constructed by weaving each wire into a uniform pattern. This creates strength and rigidity, no matter where an animal decides to test it. Made from lightweight wire, this fence is reverse woven into a hexagonal pattern. The reverse weave allows the fence to unroll flat, making for an easier installation process. With its high gauge and small wire spacing, this mesh is best suited for smaller animals. Chickens, rabbits, fish, and even small dogs will be hard pressed to compromise this design. When fencing chickens, Red Brand poultry mesh is available in one or two inch spacing. If you are fencing chicks or chickens that are especially inquisitive, one inch spacing is best. For yards that are looking to keep other pests out, two inch spacing will fit the bill. Owners of dogs that are prone to digging will also benefit from netting mesh. Apron fence has a foot-long hinge that is buried underground, keeping burrowing paws out. Saltwater mesh is coated in our Class 3 Extended Life galvanization process. This makes it ideal for fish traps, as the woven design will create a durable barricade while remaining resistant to rust. Red Brand’s V-Mesh Horse Fence is made with a continuous wire. The result is a springy texture that flexes but doesn’t break. An added benefit to continuous weave fence is its ability to help prevent unintended injury to animal hides. Fence with a square mesh design is either knotted or welded to form square or rectangle patterns. Typically, this fence is used with a heavier gauge wire, creating some of the most durable fence Red Brand has to offer. Cattle, horses, or any other large animal will be safely contained with squared mesh. For example, unlike netting mesh, each wire in Non-Climb fence is held together by our exclusive Square Deal knot. This added reinforcement allows the fence to flex slightly against the weight of a large animal, and then return to its original rigid form. This makes for easier upkeep, as knotted fence is less likely to stretch out of shape. 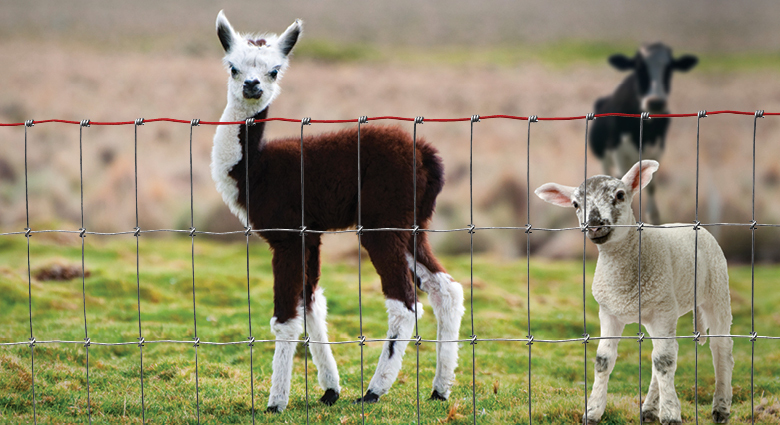 Red Brand Field Fence, Sheep & Goat, and Yard, Garden & Kennel are all made with a knotted square mesh as well. If flexion is not a concern, welded wire utility fence is a cost-effective alternative. Stockade panels are also considered to be square mesh. Made from welded wire, these panels are made for maximum strength and durability. A variety of styles and weights make stockade panels a possibility for cattle, sheep, goats, and horses. While there are many important factors to consider when selecting the right fence for your property, remember to start with mesh design. Netting is best suited for smaller animals, as the low-cost, lightweight rolls ensure a secure enclosure while providing for an easier installation process. For larger animals, squared or v-mesh fence styles provide a low maintenance, longer lasting solution to safely contain your valuable animals. For help in selecting the ideal fence style to meet your need, stop by your local Red Brand dealer or use the resources available at our website.